Beginners Telescopes – The Best Telescope Guide and Review. Stargazing for Dummies – One of the best books to buy! Stargazing For Dummies. If you have a passing interest in the night sky. Are just starting out in astronomy, or are already a seasoned astronomer. Then this is the book for you. Read on to find out even more about this brilliant guide book. For sky watchers of all levels. Written by Steve Owens. A very successful UK-based freelance science communicator, astronomer, and furthermore good friend of mine. Stargazing for Dummies will guide you through the basics. It will also make your evenings looking up at the night sky more fun, interesting and productive. This isn’t just a book for beginners. It is also a comprehensive reference book for all aspects of stargazing and amateur astronomy. From summaries of main astronomical objects, subjects and events. Through to constellation guides for both Northern and Southern hemispheres. Furthermore, to make sure they are accurate, the constellations were drawn by Steve himself. Consequently to make sure they represent the heavens correctly. Not only does Stargazing for Dummies tell you about celestial objects and events. It gives no-nonsense information on when and how to find them. Above all, helping the reader familiarise themselves easily with the night sky. Perfect for beginners and seasoned astronomers alike. The book also includes a huge variety of excellently drawn graphics and tips. Making the information very easy to absorb. Even by someone new to, or with just a passing interest in stargazing. In my opinion, Stargazing for Dummies should be treated as an essential handbook by anyone interested in the night sky. It should be kept very close to your window, binoculars or telescope. You will find it to be very handy. 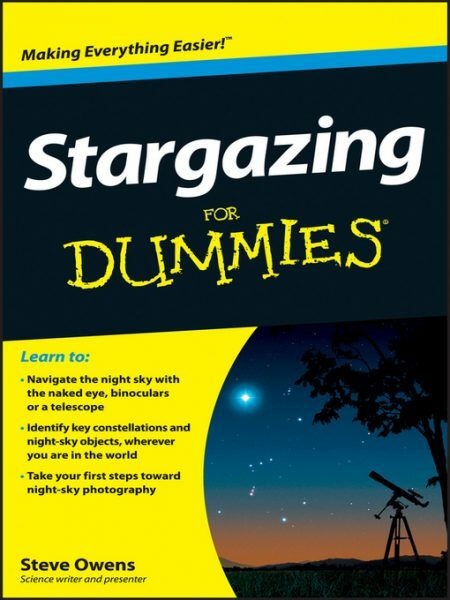 Just bought the book “stargazing for dummies”. Really excellent book and great for finding my way about the night sky. Diagrams of all the constellations with galaxies and nebulae included shows exactly where to look. Brilliant book for beginners like me and great value for money. Congratulations on such a super book. © 2018 meteorwatch.org: All Rights Reserved.